Audience members were given the option of paying extra to watch the band perform a second set following the main screening. Jim and I did not know what to expect, but we were delighted to be able to sit down. To facilitate this, the Hawthorne Theater had arranged a movie seating area, amassing many chairs packed arm to arm so it was particularly cosy with a sold-out show. Behind the stage was a king-size white tarp, hung slightly wavy. 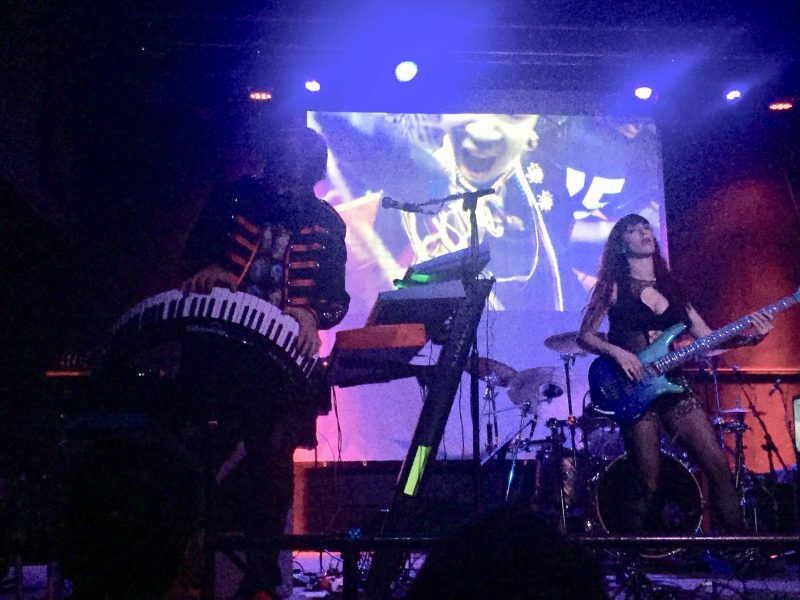 Simonetti’s synthesizers were set up to the left front of the stage, with the bass center, the guitar to the right, and drums in back. Of the original lineup, only Simonetti remained in this iteration. He was joined by Bruno Previtali on guitar, Cecilia Nappo on bass, and Titta Tani on drums. Simonetti was on synthesizers and voice, with occasional rhythm guitar. Once obscure, he is now world famous, his contributions to Giallo and Italo Disco massive. Previtali and Tani also play with Simonetti in his metal band, Daemonia. The band came on stage dressed in what some might construe as “heavy metal” attire. I appreciated this, and Simonetti’s maestro outfit embellished with golden buttons and coat tails as he sat down in front of his keyboards, quickly flashing goat horns to denote his dedication. The other band members also sat in chairs, and the film began. Audiences who are familiar with Suspiria appreciate its intense color palette, visually stunning sets, militant dance instructors, and bloody witchcraft conspiracies. When Simonetti’s Goblin started playing with the airport opening, it was somewhat confusing who to watch, the band or the movie. I opted for the band when the score was playing. They did appear a little bored in longer dialogue-laden sections of Suspiria when they were not needed and had little to do. Only Simonetti was at an angle where he could see the screen, but mostly he just stared at the floor and listened, coming to life gradually as each next cue approached. The sinister raspy voices so synonymous with the score were considerably less scary when paired with the band members making them, but the sound was nevertheless incredible. The band tours with their own sound engineer, and what the film lacked in being shown on a sheet, it made up for in sonics. We were surprised that the signature sound in the title track, that sounds sort of like a drawn out doumbek drum, is actually a bass slide. Having heard the score so many times, and not being musicians ourselves, we realized we had made incorrect assumptions about the instruments used to generate effects on some tracks on the original LP. After Suspiria ended, Simonetti introduced the second set after a brief intermission. It seemed the band had lots of pent up energy after enduring yet another screening of Suspiria. Stage hands took away their chairs and Simonetti’s Goblin played songs from Tenebrae, Deep Red, Demons, Phenomena, Dawn of the Dead, and others. With each cue, there were creepy, violent and gore splattered scenes from each movie projected behind them. From Phenomena, Jennifer Connelly is ethereal as she commands insects with a falsetto choir score, quickly cutting to the scene where she falls into a swimming pool full of maggots. From Dawn of the Dead, it was Tom Savini’s motorcycle gang massacring zombies in a mall. 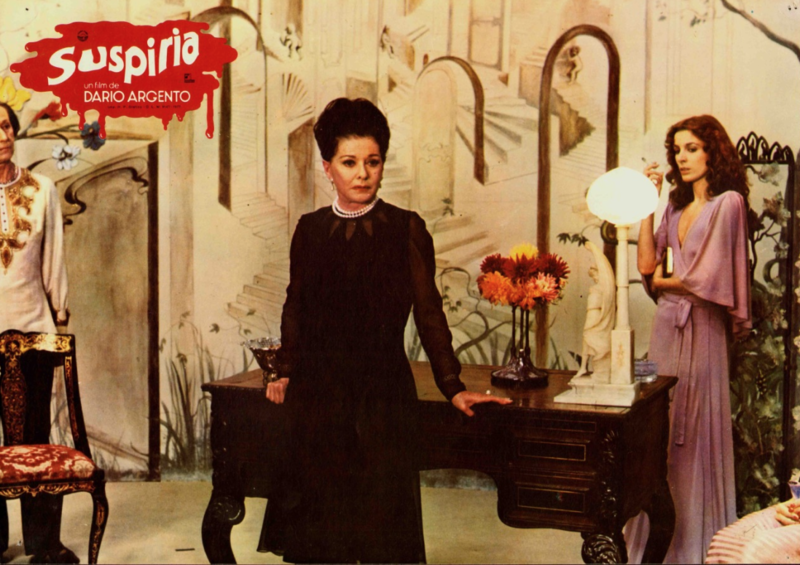 Having run through the repetitive ambient rifts required by Suspiria, it was with this set that the band really came alive, thrashing guitar and synthesizer power refrains over complex bass lines and double bass drums. We were mesmerized. Neither section of the show disappointed. Simonetti’s Goblin was a giallo proggy explosion, and we were thankful to have the opportunity to see him performing his legendary songs in a small venue packed with fellow fans.